If you’re trying to find good deals on the most comfortable mattresses near San Antonio, you’re in luck. We’ve researched the best mattress stores in San Antonio and listed them below. With almost 1.5 million residents, San Antonio is seventh most populous city in the United States, and every single person in the city needs a place to sleep. That means a big market for mattress stores, and the city has no less than 88 mattress shops to meet that need. This big city is big on bargains. Frills, features and the latest trends take a major backseat to good, old-fashioned value in this city, and many mattress stores in San Antonio pride themselves on offering highly affordable mattresses. What’s the best option in your neighborhood? Read on to find out where to find a high-quality, convenient and affordable mattress in San Antonio right in your area. Quality Mattress Co. (324 E Lachapelle) is a great source in downtown San Antonio for specialty products. This mattress shops sells not only affordable mattresses for residences but also has options for RVs, boats, dorms and health care facilities. Moving north, Cantwell Mattress Company (4915 McCullough Ave) earns rave reviews for outstanding quality and a personal service. Cantwell has been family-owned since its founding in 1920, and custom-builds each bed to customer specifications. Not only do they offer eco-friendly mattresses (in addition to other specialty models), but the store can actually recycle your old mattress. If, on the other hand, you want the security of shopping at a reputable department store- or would like to purchase a bed and sheets at the same time- Macy’s (151 East Bowie Street) also sells mattresses. Mattress Firm- Final Markdown (355 E Basse Rd) has the highest customer satisfaction of any mattress store in Antonio within the northern area of the city. As the store name implies, this branch specializes in affordable mattresses, with deep discounts on closeout and regular merchandise. Another popular chain is Factory Mattress, which has no less than 11 mattress stores in San Antonio as a whole. Their presence in San Antonio’s northern neighborhoods includes mattress shops in Arbor Park (17700 U.S. 281 Access Rd), Bitters (13111 San Pedro Ave), Alamo Heights (6801 San Pedro Ave), and Northwoods (17700 US 281 Access Rd). Each sells brand-name mattresses and earns great reviews for straightforward customer service and quality. 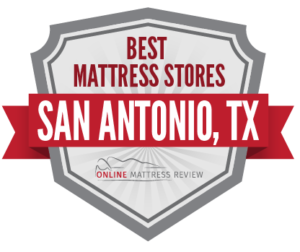 After Mattress Firm, Optirest Mattress (5563 De Zavala Rd) is the highest-rated mattress store in Antonio within the northern area. This mattress shop specializes in natural latex foam, and prides itself on customer service, with sales associates specifically strained to educate rather than upsell. There are fewer mattress stores in San Antonio as one drives south, but a few mattress shops in the area do stand out. Two in particular, Mattress and Furniture for Less (1049 SE Military Dr) and Better Price Mattress (600 SW Military Dr), are notable for selling affordable mattresses. Since they are located on the same street, just one mile apart, shoppers in search of a bargain can easily comparison shop to find the best price. Always reliable, Mattress Firm also has a presence in the area, with Mattress Firm- South San Antonio (2549 SW Military Dr), located on the same stretch of expressway. Shoppers looking for an affordable mattress in San Antonio east of the city center should try Factory Direct Mattress (3435 Thousand Oaks Dr), which specializes in low prices on name brands. This highly-reviewed mattress shop sells bed frames as well. Big Dan’s Furniture and Mattress (8118 Interchange Pkwy) also earns top marks with shoppers, with a record of great service, especially speedy and affordable delivery. If you’re looking for a big-name retailer, you can’t go wrong with Factory Mattress- Live Oak (14615 N I-35) or Mattress Firm- Stone Ridge Market (21019 US 281). Factory Mattress dominates the market for mattress shops in San Antonio’s western neighborhoods. The franchise has stores in Mountain View (10670 Culebra Rd), Bandera (11631 Bandera Rd), Military Crossing (7431 NW Loop 410) and, on the same road, Leon Valley (5628 Northwest Loop 410). Just a block down the street from the latter, you’ll find another mattress store, Mattress and Furniture for Less (5744 Mobud St), which specializes in affordable mattresses. This locally-owned store has a solid reputation for value and has been in business for 30 years. Here, you can purchase a bed frame for your new mattress, as well as furniture for the whole home.